from other stone based materials can be formed in a mould which allows for the mass production of many types sizes and shapes of garden planters at relatively low prices. 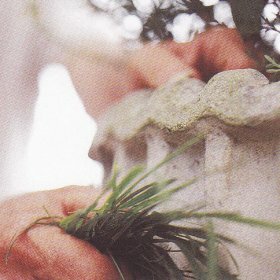 Reconstructed stone - which is simply stone "powder" bound with an adhesive - is used to make authentic-looking copies of traditional planter shapes, like urns and pots mounted on pedestals. Some manufacturers in an attempt to make their new planters look old and weathered also use coloured additives and surface coatings in the production process. Many contemporary planters, however, are available in simple square or cylinder shapes and their appeal relies on the smooth matt surfaces and pale grey and white tones that reconstituted stone, concrete and terrazzo finishes have to offer. 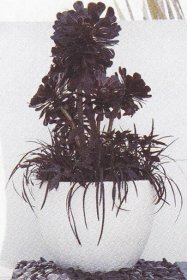 To achieve an aged appearance, you need to establish the growth of algea and lichens on the planters surface. To encourage algea growth, you need to supply nutrients for the organisms to grow. Simply rub lush juicy grass over the planters surface. The grass stain soon turns brown, or, alternatively you could brush a thin layer of diluted natural yogurt over the planter surface.